At St Margaret's Primary Academy, students will encounter these principles throughout everyday school life. In particular, our promotion of spiritual, moral, social and cultural understanding is where these value are explicitly taught in a range of ways including through R.E days and interwoven within our curriculum, which gives children real and meaningful opportunities to explore these values. We are certain that the active promotion of British Values means that children are enabled to develop a sense of community and begin to develop their understanding of their role and responsibilities within it. We have recently introduced a weekly focus so that all the children are explicitly taught vocabulary, skills and understanding of British Values and SMSC and how this applies to our everyday life. Our whole school systems and structures lend themselves to the active promotion of British Values, heavily. For example, all children take part in a democratic school council election process and elected children run a successful school and learning council. Democracy ~ The children get the opportunity to vote for our School Council and Learning Council, who provide an important voice for our children within the school community. Their representation is invaluable, whilst it contributes towards how school is run. We also have a parent committee, and offer parent surveys at parent evening. Rule of Law ~ We have a positive beahviour policy, where the children aim for gold. Within our school community, we all work together to ensure that all the children feel safe, happy and confident to follow the school rules. During election time, we also discuss the importance of the vote. Individual Liberty ~ At St Margaret's Primary Academy, it is crucial that the children make their own choices, from choosing what sports clubs they attend, to choosing their lunch. We promote the choice where possible. Mutual Respect ~We promote kindness and respect within our school, through all aspects of our school day, we encourage respect and care for each other. Our Rainbow Room encourages children to develop a mutual respect for their classmates, teachers and other staff. We also provide support for children with English as an additional language, to ensure that books and other materials are relevant. Tolerance of Different Faiths & Beliefs ~ The children enjoy learning all about many cultures, faiths and beliefs and we celebrate and recognise these events throughout the year. We also ensure that our library is well stocked with resources for learning about various customs and cultures from around the world, where the children have access to different cultures in their stories. What's been happening so far? It's been a busy half term for British Values within the school with lots of links being made by the children! We've introduced the British Values to the children, with children sharing their thoughts on what they think each one means. We will be introducing these more in depth over the next term. World Down Syndrome Day- On the 21st March, the teachers all wore silly/odd socks to celebrate World Down Syndrome Day. We used this an opportunity to discuss the British Value- Tolerance and Respect. The children were thoughtful and considered how everyone has their own unique traits, and that we're all different in many different ways. World Book Day- What a fabulous day! We all dressed up to celebrate our favourite books and were all hooked to a story from Mr Mo! For our Creative Writing Week, we all wrote autobiographies. We used our knowledge of these to write biographies on a famous British person who has made a difference to our history in relation to our topic. For example, Reception looked at Julia Donaldson, Year 1 looked at Edith Cavell, Year 3 looked at James Hutton (a petrologist) and Year 6 looked at J.K Rowling. You should have a read of our biographies! This half term, we have introduced recycling bins into our classrooms which the children are already responding to. 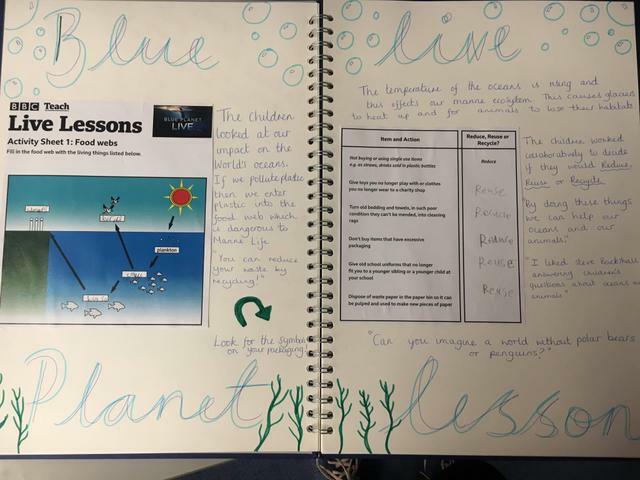 KS2 took time out of their curriculum to watch BBC Blue Planet Live lesson, where they learnt about food chains, as well as recycling. KS1 looked at recycling in curiosity cafes!